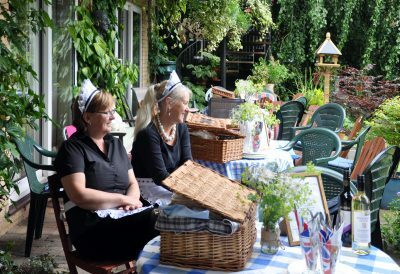 Ladies who Lunch wanted a change from the usual restaurant review… something outdoors perhaps? So we decided to have a picnic party with a difference. No soggy tomato sandwiches and warm Pimms. Just beautifully prepared food, done by someone else. Have you ever thought of having caterers in for a party? It’s not as expensive as you might imagine – oh and the work you save! All our food was prepared, served and cleared away by two happy ladies in smart waitress uniforms. These are the ladies from Three Tiers Catering whose name came from their original concept – afternoon tea served on a three tier cake-stand. You select the venue, which can be anywhere from your own home to a more formal setting. On arrival we found that each table had its own picnic basket full of food ready to be served, all we had to do was take our seats. And eat! Our first course consisted of lovely finger sandwiches with assorted fillings – egg, cheese, ham and chicken with a large sausage plait per table to cut up and share. There were pots of homemade chutney and coleslaw, and the dinkiest little tarts filled with cheese and leek. We couldn’t wait to start eating. Our later courses were delivered individually by Liz and Jackie. We had scones and jam followed by a trio of mini desserts: lemon Eton mess served in pretty coffee cups, chocolate profiteroles and fruit custard tartlets. They might be mini in size but they are maxi in taste and presentation, and you get a trio of each per person. Then there was the option of cheese and biscuits with and coffee or tea to follow. Many of the items were homemade and their elderflower cordial is a wonderfully cool alternative to wine. Pretty flowers, fresh tablecloths and a framed menu complete the service – oh, and the clearing away and washing up too! All that for about £6.50 per head! The ladies can accommodate bookings that include breakfasts, weddings, funerals, beach parties, anniversaries and birthdays. The minimum number that these ladies will cater for is approximately 20, which is perfect for groups such as book clubs, line dancing teams, swimming groups, sewing circles – you name it, and there is no maximum number. You will need to book in advance, so don’t hesitate to get in touch straight away. Vegetarian and gluten-free food can be ordered. We really enjoyed our treat, and best of all, we were encouraged to make full use of doggy-bags for what little there was left at the end.